"Our Nut Brown Ale starts out very smooth, like an English-style Brown Ale. The use of Chocolate Malt, Munich Malt, and Hallartau Hops give this beer a crisp, nutty finish. 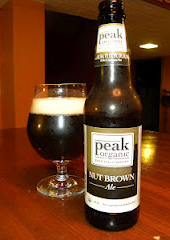 Peak Nut Brown is a delectable beer loaded with complex, differentiated flavors that don’t overwhelm the palate, making it a perfect dark beer for food pairing." This ale pours a deep burnt orange. It has a one finger head with decent lacing. The aroma is light and sweet with hints of bread and yeast. Not very "big" in any direction. The taste is very balanced with sweet malts a hint of coffee and a sharp crisp finish coming from the Hallartau hops. It has a thin mouth feel but the complexity makes up it.